It’s been many years since OBD2 adapters became popular among DIYers, car enthusiasts, or professional mechanics. 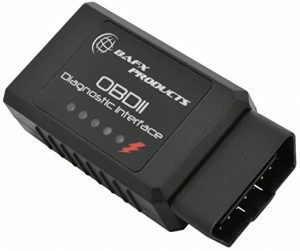 Countless brands and models of OBD2 adapters has been released. However, many of them are copied or cloned, and 3rd party sellers create and sell them as their brands. Some of them may be fine, but it’s important to choose reputable and trustful sellers. In 2017, a list of the best OBD2 adapters for Android isn’t much different from the previous year, but keep in mind that some high-end adapters are improving and adding more features without an additional cost. Here are the best OBD2 adapters for Android in 2017. BAFX Products adapter is the best seller on Amazon for many years. It’s a basic adapter using Bluetooth to connect to your smartphone or laptop. It doesn’t have fancy or exclusive features. And, it’s not compatible with any iOS devices. The size of the adapter is large. Depending on the location of OBD port, you may have a problem with its sticking out too much or falling. The reason it’s the best seller for a long time is that the adapter is reliable and sold by a trustful seller with good customer support. There are no copied products of BAFX. They are sold by the manufacturer only. You may find re-sellers on eBay or other online shopping sites, but as long as you buy from Amazon, you will get the right one directly from the manufacturer (via fulfillment by Amazon.) BAFX adapter comes with 2-year manufacturer warranty. 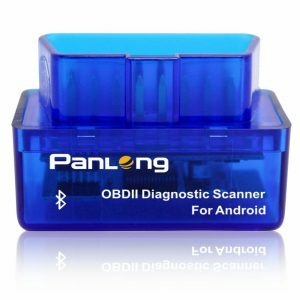 Panlong PL-B02 adapter is another basic OBD2 adapter. Just like BAFX adapter, it uses Bluetooth to connect to your smartphone or laptop, and it’s not compatible with iOS devices. It’s one of the least expensive OBD2 adapter. What’s remarkable is the size. It’s only 1.3-inch long. No matter where OBD port is, it won’t interfere with your driving. The case is blue-tinted transparent plastic. It’s cool to see a circuit board and LED lights through it. You may find similar or somewhat identical products with different brands on Amazon, eBay, or other online shopping sites. But, I recommend buying Panlong PL-B02 on Amazon because of many positive reviews and feedback. It also offers a 100% money back guarantee and 1-year replacement with professional customer service. 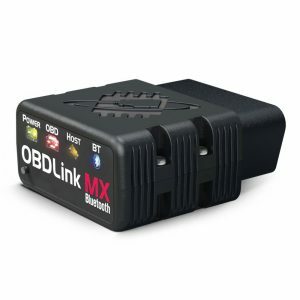 OBDLink LX is a fast and reliable OBD2 adapter using a Bluetooth connection. It’s not compatible with iOS devices. The manufacturer claims that it’s up to 4 times faster than competitors. “Fast” means that it provides more data points and quick responses. For example, when you see live data, the graphs are moving smoothly, and the gauges actions are realistic. And it has BatterySaver technology, which allows you to leave the adapter plugged all the time without worrying about a battery drain. In addition to many third-party OBD2 apps, the adapter is exclusively compatible with a free Android app called OBDLink. There is nothing special in the app because it’s very similar to Torque or other OBD2 apps. However, OBDwiz, OBD software for Windows, which also comes with the adapter, is valuable because many other software for Windows are either expensive or junk. 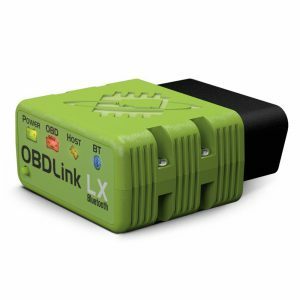 OBDLink LX offers a 3-year warranty and lifetime software and firmware upgrades. OBDLink MX has all features and functions of OBDLink LX plus the compatibility with two additional protocols; SW-CAN and MS-CAN. These protocols are used in late GM, Ford, or Mazda models. If you have these models, you can perform enhanced diagnosis such as ABS, SRS, Transmission, etc. You may need to purchase apps or software, though. And for supported GM models, it allows you to control windows, door locks, and even remotely start your engine with the 3rd-party obdCANex Android app. As I mentioned above, OBDLink MX has all features of OBDLink LX including up to 4 times faster than competitors, BatterySaver technology, compatibility with OBDLink Android app, a free Windows software OBDwiz, a 3-year warranty, and lifetime software and firmware upgrades. 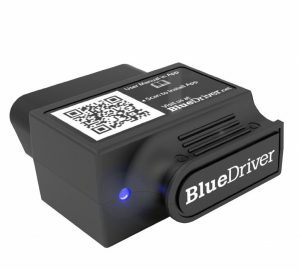 BlueDriver is an OBD2 adapter using Bluetooth to connect to your smartphone. Unlike all other adapters above, it’s compatible with iOS devices in addition to Android. BlueDriver is focused on vehicle’s diagnosis. It’s compatible with BlueDriver app only. So, if you want to try many third-party apps, BlueDriver is not the right choice for you. And, the BlueDriver app is available at Play Store for Android and App Store for iOS, not available for Windows. BlueDriver adapter and app offers professional-grade features and information when it comes to vehicle diagnosis. When you get a trouble code, you have access to Repair Reports drawn from a database of over 6.6 million fixes verified by certified auto mechanics. The reports contain details of the problem on each trouble code, possible causes, and repair information. It can also perform enhanced diagnosis such as ABS, SRS, and transmission for supported makes and models. At the time of writing, supported makes for enhanced diagnosis are GM, Ford, Chrysler, Toyota, Nissan, Honda, BMW, and VW with some models exceptions. This coverage is expanding. In fact, when BlueDriver was just released, supported makes for enhanced diagnosis were only GM, Ford, and Chrysler. In just several years, BlueDriver has been improved a lot, and it keeps growing. It’s worth noting that there is no additional cost. Pay for the adapter, and you can have access to all existing features and new features which will be available in the future. Dimension 1.8" x 1" x 3.5" 1.9" x 1" x 1.3" 1.8" x 0.9" x 2" 1.8" x 0.9" x 2" 1.9" x 1" x 2.2"